I received lots tutorial requests from my readers that asked to me, how to start iPhone and iOS application development. We are planning to write a iPhone and iOS application development tutorial series for this you need a Mac iOS and Xcode IDE. Just follow these steps and you can create a simple “Hello World” program. 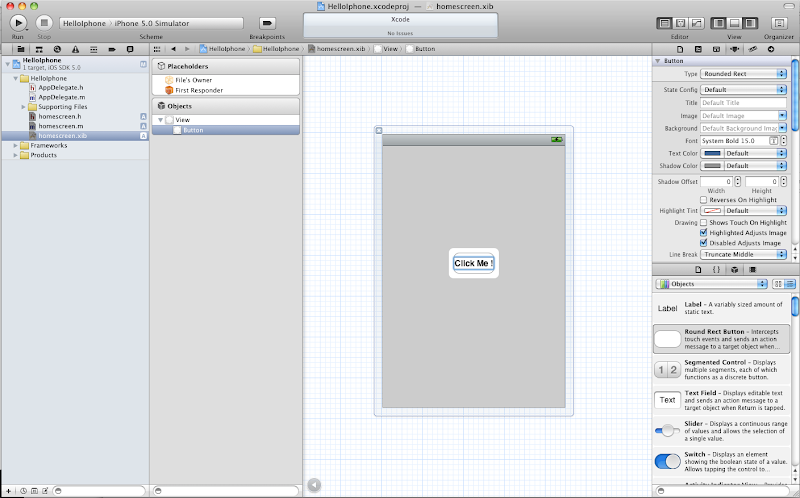 Open XCode and click create new project as shown in below image. 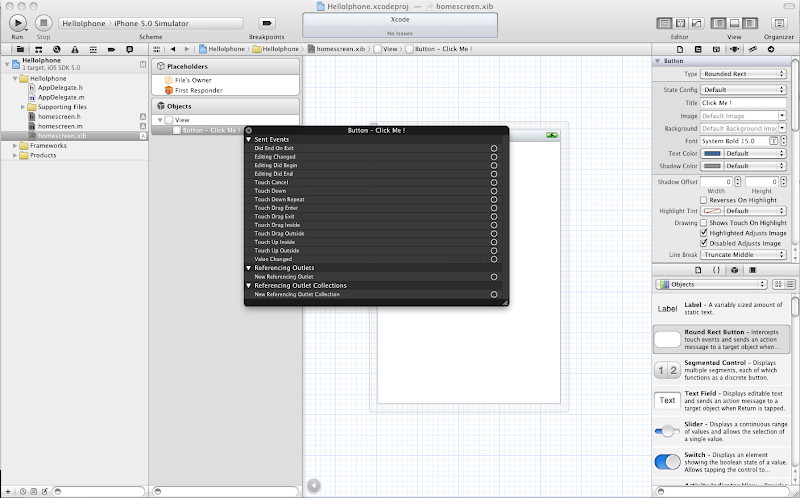 Enter project name and set device family as iPhone. Set project location and click create button. Your project will be created as shown below. Project property windows contains appdelegate files and other supporting files. We need to create a screen/class with xib(user interface). 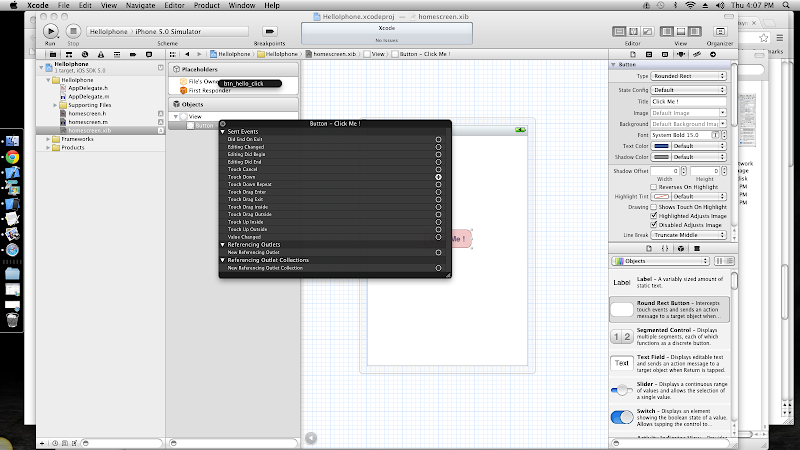 Right click on the project folder and select new file as shown in the below image. It will ask you to select location to create file. You no need to change the default location. You can click create button. 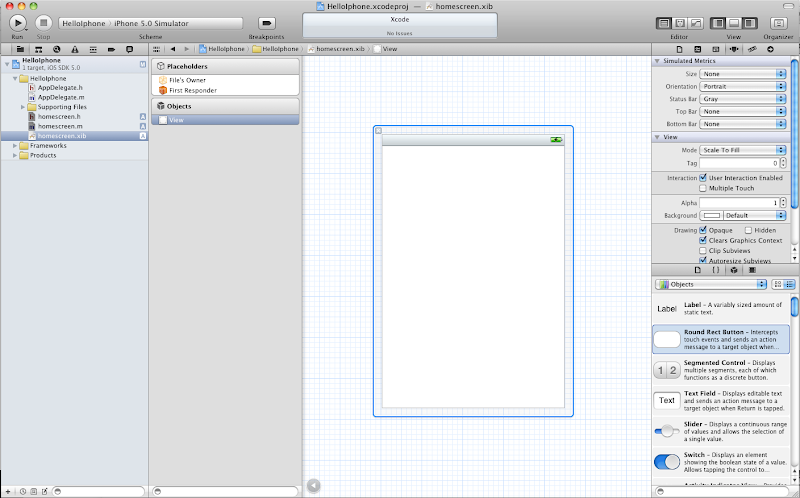 Home screen has been successfully created and it will look like below image. Now open homescreen.h file and create a UIButtonField with its onclick function programmatically with the below mentioned code. 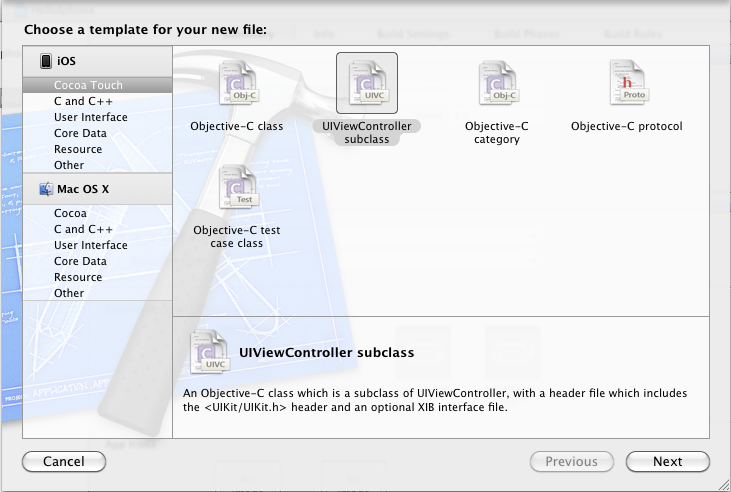 UIAlertView* alertView = [[UIAlertView alloc] initWithTitle:@"Success !!!" Now it’s time for design part. 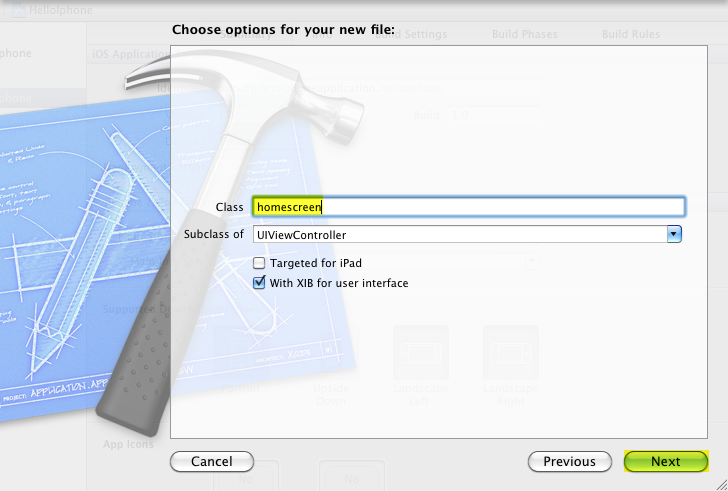 Open the homescreen.xib file and drag a button in the right side object window and drop it in the view controller. 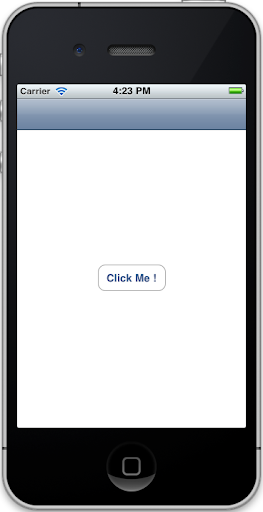 Now double click on the button and enter text as “Click Me !”. Now click on the “Touch Down” option and link it to “File’s Owner” as show below. Now the button click function declared in header and main file will get pop up. Select the function. This process will link the function to the button click event. So design part is over. Now your application is ready. 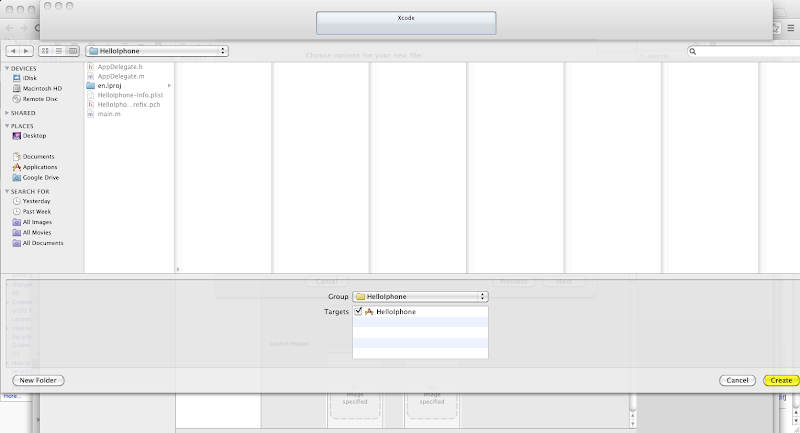 But, the problem is this is an empty application. Application don’t know where to start. So we need to redirect the application to the home screen. Your AppDelegate.m file will look like below image. Now it’s done. Click on the run icon on the top left corner as shown in below image. Now click the “Click Me !” button. Congratulations. You are now a iPhone developer. but then also thanks for the tutorial! cool.. but how to i test it on my iphone?? thanks for you tutorial, I´m waiting by the next tutorial, thankssssss !!! 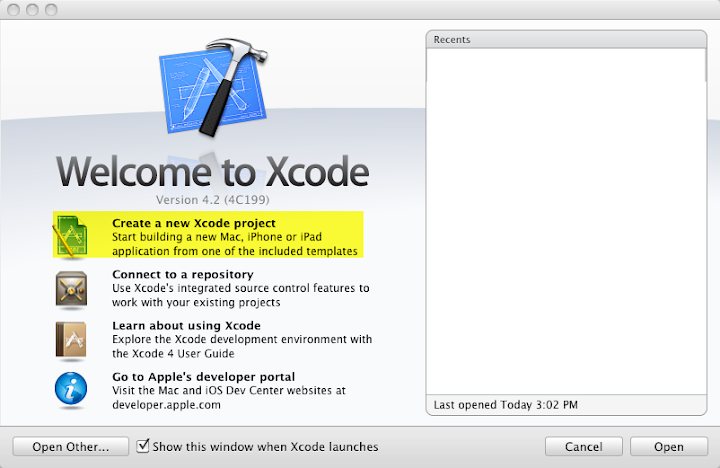 Can you please tell me from where I can get Mac iOS and Xcode IDE. Is it possible to develop iphone applications on Windows ? Again a great lesson from 9lellons. Thanks a lot. How To I Deploy In Operating System Windows 7...?? 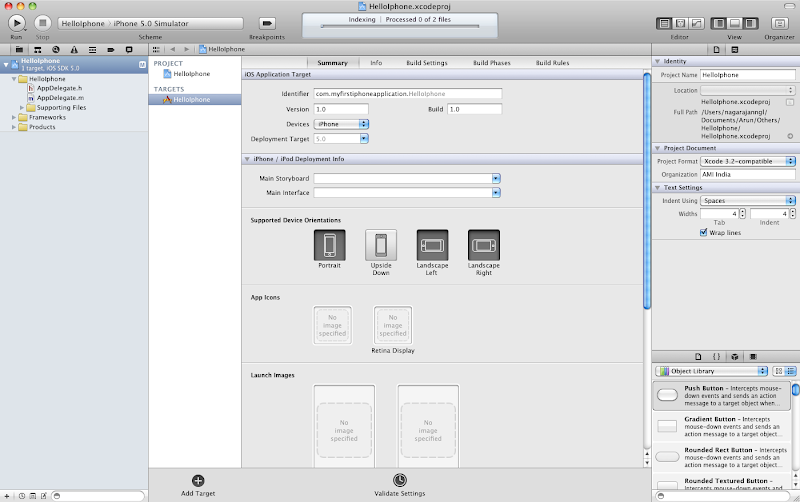 How can i download Xcode iphone simulater for windows 7? Nice Sharing Arun. Thanks a lot! you are providing a nice step by step information but i can not displying the images which you are post in this blog.this tutorial is very helpful for me in future because i want to learn an iPad development. Fantastic tutorial you have given great! great style to explain the things.. I waited this tutorial since two years , thank you Arun! 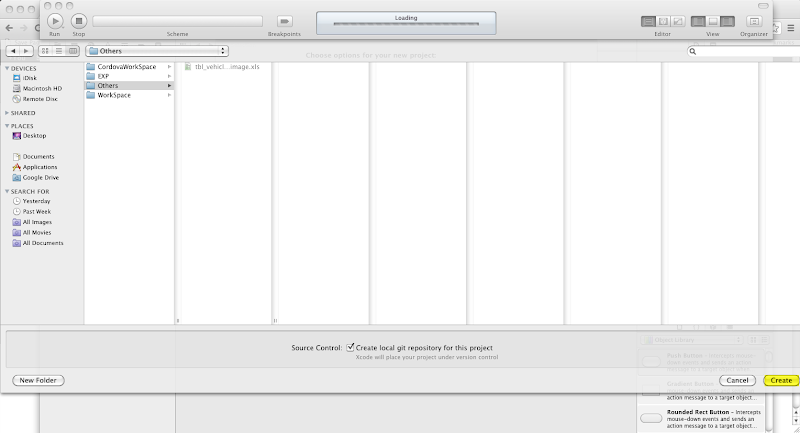 Officially it is not possible to develop native IPhone applications in windows OS. But unofficially, i heard that OS X(mac OS) can be installed through virtual machine in windows OS and application can be developed. I will try on this process and if i get succeed means i will post that as an article here. When will you publish the next tutorial?? 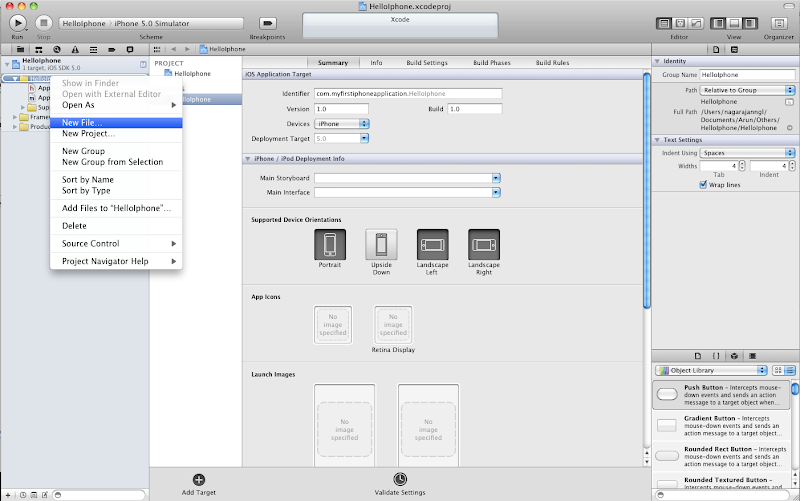 This is a nice tutorial to develop your own first iPhone Application. @Yanker: Next tutorial is almost ready. Will publish soon. 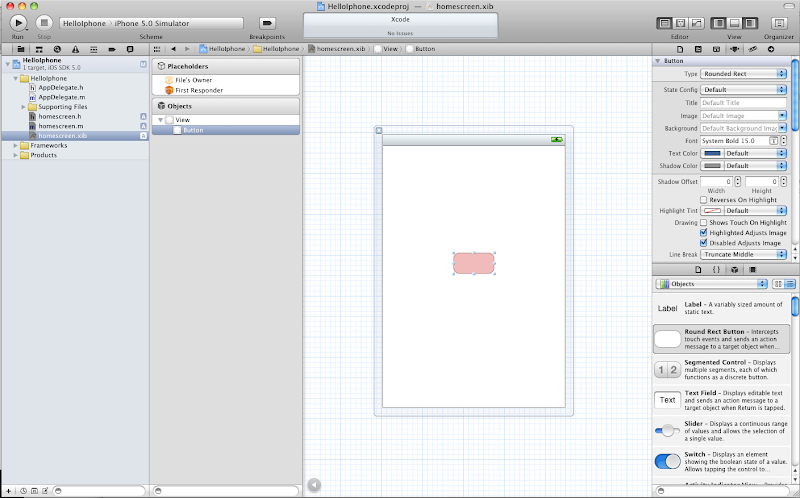 can i xcode on vmware mac image? There is big range of people are using Mobiles app so its necessary think to iPhone app development.You are describing good information about iPhone app development. Great article dude! Best part about this article is the step by step approach towards the process of iOS app development. Am sure a lot of readers, especially developers, will be greatly benefited by this article. Thanks for this 16 Excellent Steps to Develop iPhone Apps To Success In Iphone Application Development. It´s people like you who make the Internet to a such fantastic and great forum for collaboration and learning. Keep up the good work! 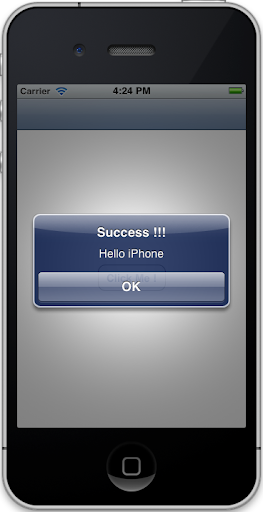 Thanks for providing this useful tutorial in developing a simple iPhone “Hello world” program. The screenshots that you have provided are useful in understanding the various steps with clarity. The people who want to develop iPhone application on windows should remember time is precious. 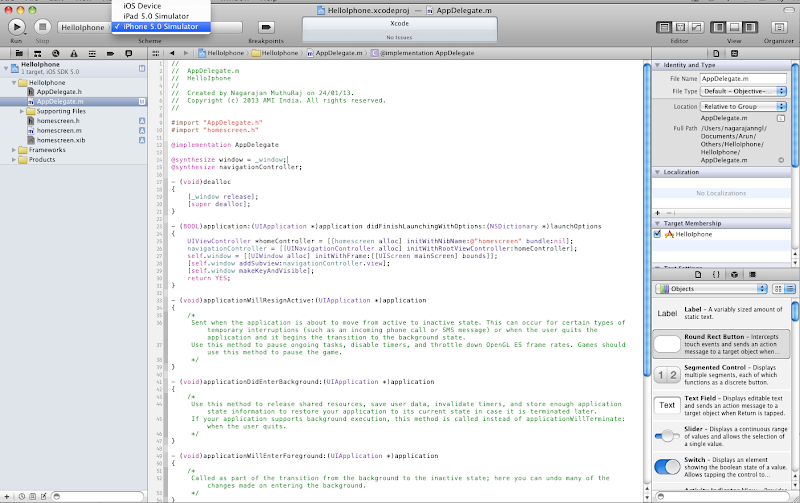 Tool that can be used for iPhone app develpoment is the Dragonfire SDK. Firs app by picking a project that you simply would get pleasure from completing. Don't select a quite difficult project or even a project that takes a extended time. The information in your post about iPhone is more interesting. 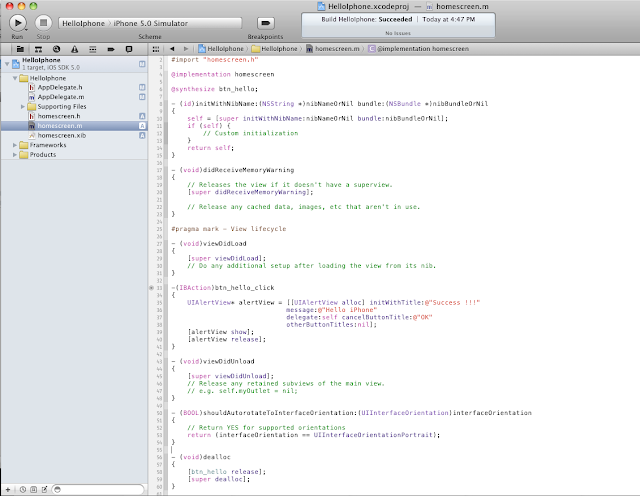 and this info is more useful for the developers to develop the iPhone apps. Thanks for share this valuable info. This is a very simple but effective tutorial that is clearly illustrated with the help of various screen images and graphics to develop very simple “Hello World” program without too much technical knowledge. These days, there are already several applications that could achieve iPhone app growth on Windows. 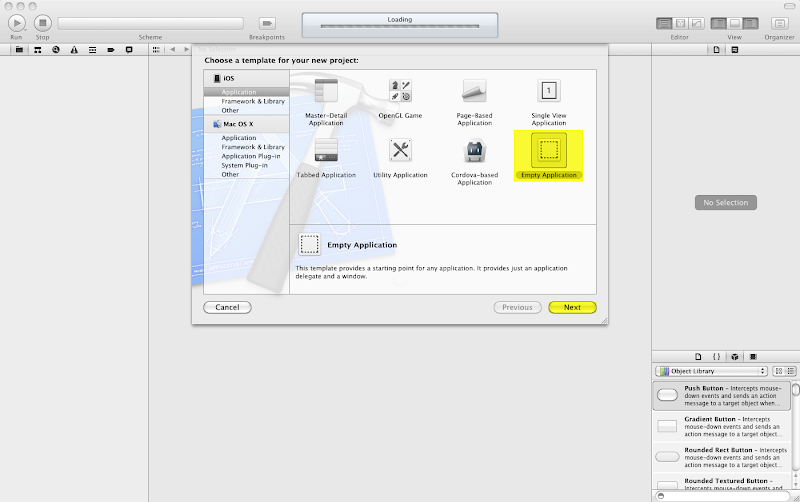 The applications gather requirements the same as a Mac. Nice post. Thanks for sharing step by step approach towards the process of iOS app development. Looking forward to further information about iPhone application development. You have provide a nice and step by step info, lots of developer are gone love this blog because this blog contain so many useful information for developer. 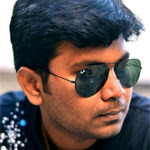 really very interesting and step by step guidelines to be iPhone Apps Developer. This is really going to help a lot for those who want to be a iPhone Developer. I didn't import homescreen.h into AppDelegate.h at first, had to dig around a little to figure that out. Great tutorial however. We are now looking for some more advance tutorial from you. 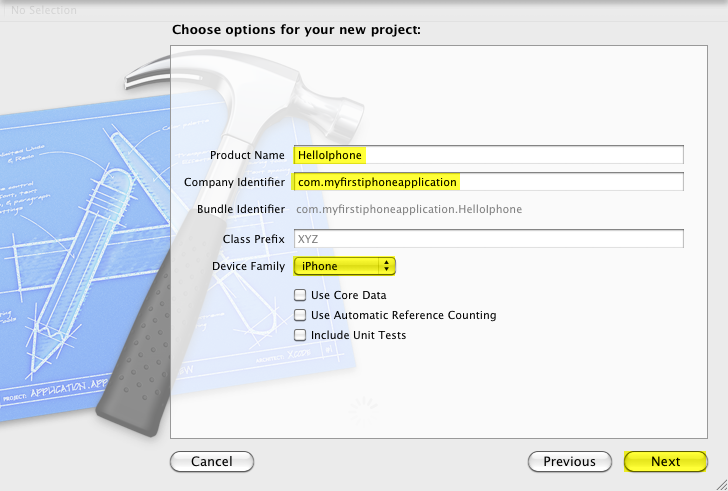 As this tutorial supposed to help new developer to learn more advanced functionality for iPhone application development. This was an interesting tutorial. Might be months later I am been here for learning this JSON Parse but any way this is good that helped me a lot. Thanks for the good share of content. I really appreciate your post. Thanks for sharing such a valuable information. iPhone application development industry is increasing rapidly and now a days its pretty simple to get your favorite application in mobile.Thanks!! Hi, very nice blog, it is easy to understand of Guidelines for iphone application development, Thanks for sharing this useful info..
Great Job... You have explained the entire development process in such easy words that will not only going to help the newbies but also the the experts. The images used are brilliant which will give an nice illustration for each step.